Still standing, and more or less unmodified, although the house is in need of some sprucing up. The decorative grillwork on the roof is gone, and the house may be sided. 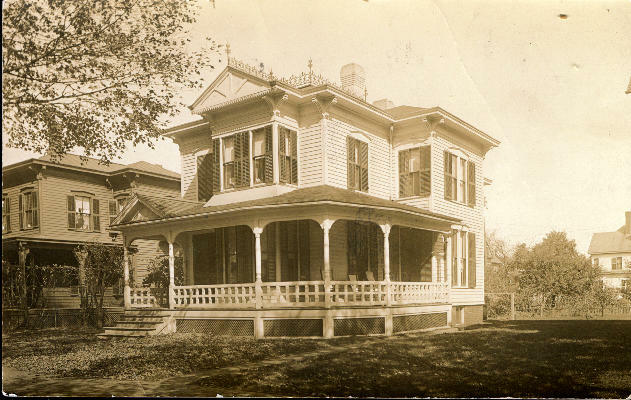 This house is listed as being owned by J. Fuller in the 1904 city directory. This matches the signature. Will you please let me know right a way (sic) if you need to do any more work. I am very much in need of something to wear. Let me know as soon as you can. Mrs. Fuller. [I also came across a second copy of this postcard, also addressed to Mary Cronin. The text is:] Could you fix my lining next - I was go (sic) to meet Mrs. F. in Palmer and go with her for the day for I would have to go home on he five to connect for Stafford. Write me at Stafford I go home tonight. - Mrs. Witt.